The world we live in is becoming more digitized and urban, the need for a real experience in nature becomes more valued. Spending time in the wilderness offers opportunities to exercise both the mind and body, whilst sharpening the senses, learning new skills and expanding your knowledge of the landscapes you will explore.A walk on the wild side focuses on offering adventures to small groups, by limiting numbers participants gain far more from their experience than larger group trips. Beyond improved fitness, benefits of time spent actively within nature are myriad. The medical community increasingly expounds it as an effective tool for the healing of troubled minds, with more and more evidence that green exercise provides relief from depression. Wilderness adventures are also grounding, challenging us to break away from the convenience of everyday lives and reconnecting us with inner reserves of strength, resilience and ingenuity we may have forgotten we have. 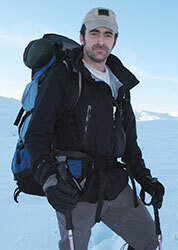 Run by Giles Price – a former Royal Marine Commando, renowned photographer,qualified MTUK Mountain Leader and ITC Certified Outdoor First Aider. We will build you a bespoke experience to meet your needs.